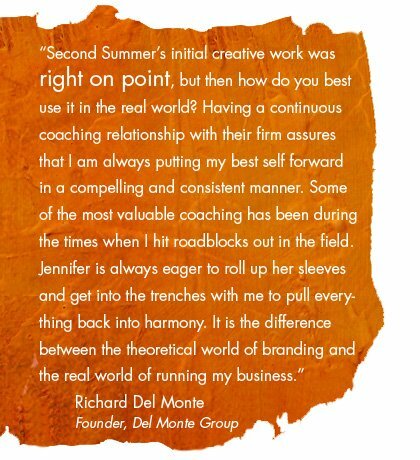 Second Summer invites you to transition from the outdated paradigm of branding as a sales and marketing tool and into the new realm of Unique Story as a Relationship Model. It’s a place where the essential magic you create for clients becomes the DNA of your communication and the dialect of your relationships. It allows the ideal relationships you celebrate on your best days to become the systemic model of your firm. Is Brand Leak™ holding you back? Brand Leak is when the true nature of what makes you different isn’t getting through to the marketplace as powerfully as it could and it limits your opportunities. Prospects can’t discern how you’re different from their status quo and longstanding relationships still view you in decades-old light. Brand Leak can block inner-circle referrals, limit professional intimacy and hinder cross-selling opportunities. Unique Story is the true nature of what makes your organization different from everyone else who claims to do what you do. It’s the essence of why people are drawn to be in relationship with you. Unique Story sits just below your conscious thinking. It’s embedded in the culture of your organization, your relationships with your team and your fireside chats with prospects, clients and centers of influence. Every great firm has one – it’s simply a matter of drawing it out. Unique Story is a tool for systematically and systemically attracting those cherished relationships that – until now – have come to you through luck of the draw or simple good fortune. Second Summer leads entrepreneurs through a deep discovery process to unearth, synthesize and articulate your Unique Story. We then develop traditional and non-traditional tools to weave your Unique Story systemically through the daily communication, environment and behaviors of your organization. We believe the traditional connotation of branding as a sales and marketing tool is both limited and outdated. Branding seen in this light isolates the use of your story to certain conversations and conference rooms. Second Summer takes a much broader approach: Unique Story as a Relationship Model. In this light, Unique Story actually has greater impact on sales and marketing. However, its reach is far broader. It deepens your best existing client relationships. It captures the secret sauce of the firm’s founders as your next generation of leadership strives to carry your story forward. It helps you recruit great-fit team members. And it flows outside of your firm into the circles and communities that matter to you most, allowing each and every individual to understand the value derived from being in relationship with your firm. 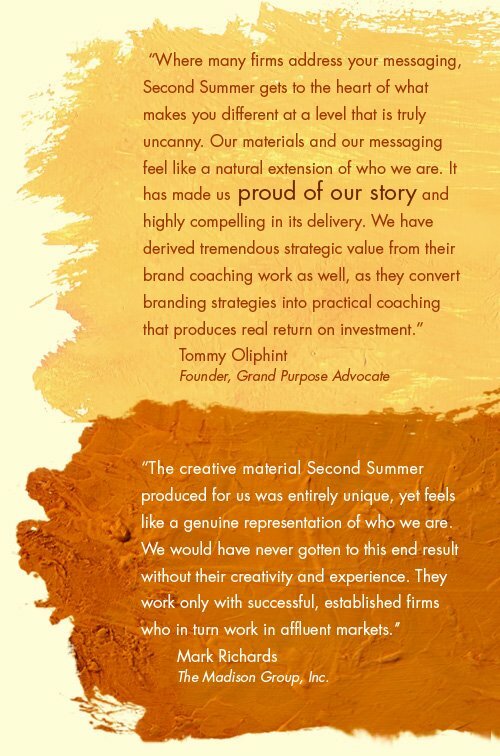 Second Summer has a 20-year proven-process to unearth, package and articulate the Unique Story of your intellect and your organization. We actively apply your Unique Story™ as both a magnet and a filter for Shared Purpose relationships. • Experience the firm-wide momentum that’s achieved when your Unique Story™ is the wallpaper of all communication and relationships. • Watch your rainmakers and team members transform from individual excellence to the spring-loaded impact of Unique Story as a drawing agent for Shared Purpose relationships. • Delving below your conscious daily vernacular, we unearth the underlying pearls of wisdom that draw people to be in relationship with your firm. • You’ll transition from being in the zone on any given day to owning the zone every day. From the intangibility of relationship chemistry to the intentionality of consistent results. • Those cherished relationships in which alignment comes quickly and trust and confidence are the landscape of conversation. • You and the client value each other equally and the relationship operates from a deeply mutual place. • Your highest potential effervesces. Innovation flows with ease. Progress and impact are commonplace. • The systemic internalization of your Unique Story™ catalyzes a wake-up call to those who can derive value from your work. • Prospects draw down their defenses to take a closer look. Clients who already seemed all-in step in even deeper. Talent, profitability and value flow in both directions. Second Summer works exclusively with firms that believe in the long-term journey and potential of Unique Story™ as a Relationship Model. As such, we engage with new clients who are committed to a recurring annual engagement. We intentionally foster a handful of relationships outside of financial services. We have found the challenges of Brand Leak™ and the opportunities embedded Unique Story apply wholeheartedly to other high-end service niches in which all organizations are made to look the same. In addition, Unique Story as a Relationship Model is highly transferrable to affluent families who wish to capture the essence of their family culture. 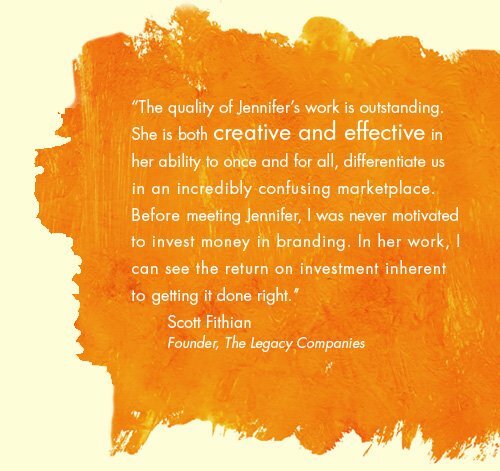 In 2000, Jennifer founded Second Summer Incorporated to offer intensive one-on-one coaching to the upper echelon of established advisors nationally. Jennifer has been a ghost writer and brand development coach to many of the industry’s top private firms and their affiliate organizations. She served as co-creative counsel in the development of The Ultimate Gift Experience and is a member of The Ultimate Gift Experience Founders’ Circle. On behalf of Scott & Todd Fithian, Jennifer ghostwrote their book, The Right Side of the Table. Second Summer’s trademarked philosophies and strategies, and the creative materials that tactically implement those strategies, have helped advisors engage clients worth $5 million to $5 billion. Jennifer has been an avid writer since age eight and during high school gained a heightened interest in business-to-business copywriting. 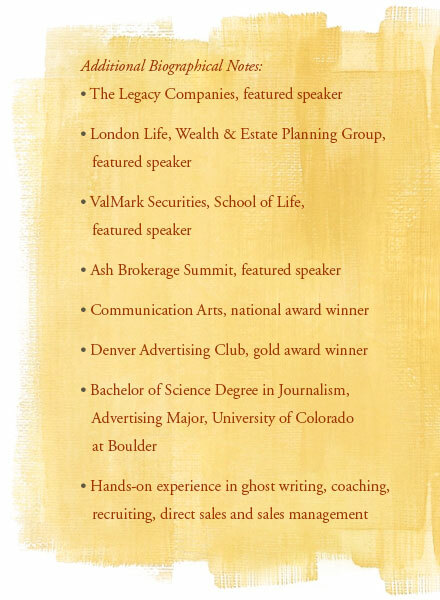 With this in mind, she enrolled in the advertising program at the University of Colorado at Boulder and graduated as an advertising major in 1990, with a Bachelor of Science Degree in Journalism. After college, Jennifer worked as a Vice President of Marketing for two start-up companies that marketed financial products to entrepreneurs and accountants. At both companies, she wrote and managed all of the print advertising and direct mail programs while also recruiting, training and managing the sales teams. Finding she had a natural affinity for aligning the sales and marketing processes to produce results, she joined a regional office of Lincoln Financial Advisors in 1994 and developed a marketing department to serve their top advisors. While there, she provided one-on-one consulting to the company’s top advisors nationally and successfully recruited multi-million dollar advisors away from other firms. She was engaged as a consultant by three additional offices to develop marketing departments in their regional profit centers. Jennifer founded Second Summer in 2000. Second Summer: What’s in the name? Second Summer is named after Jennifer Summer Tolman’s grandmother, Frieda Summer. Frieda was an avid painter and fine artist and was always Jennifer’s creative inspiration. Growing up, while other kids were making Santa Claus ornaments out of popsicle sticks, Jennifer and Frieda were carding raw sheep’s wool, dying it on the stove, spinning yarn on their spinning wheel and then weaving it into tapestries on Frieda’s giant floor loom in the attic studio of her Queens apartment. 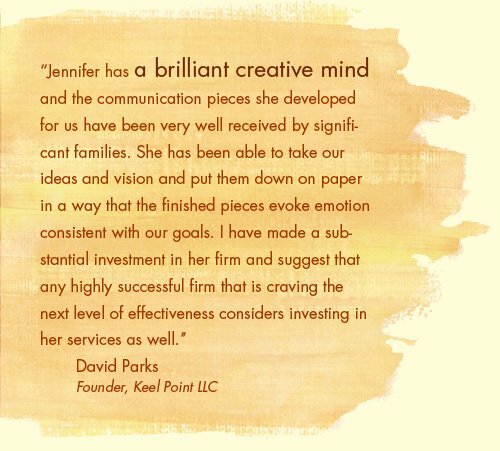 From Frieda, Jennifer discovered the importance of texture and connectivity in the creative process. Never a business woman, on her death-bed Frieda told Jennifer to start her own firm so she could do only those things she loved to do. Second Summer was founded six months after Frieda’s passing.